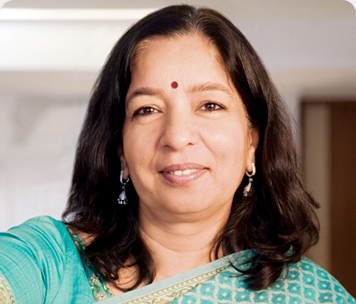 Shikha Sharma is the Managing Director & CEO of Axis Bank since 2009. Axis Bank is amongst the three major private sector banks which commenced business in 1994 as a consequence of the liberalization and reform of the financial sector. Previously, she was the Managing Director & founder CEO of ICICI Prudential Life Insurance Company. She has done her B.A. (Hons.) in Economics, and completed her Masters of Business Administration from the Indian Institute of Management, Ahmedabad in 1980. She has a Post Graduate Diploma in Software Technology, from the National Centre for Software Technology, Mumbai. India@Kellogg spoke to Ms.Sharma about her views on the Indian banking sector and the strategic priorities for Axis bank. Q. Ms. Sharma, thank you so much for agreeing to speak to us. Since you took over as CEO, what have been your key priorities? In the three years I have been here, I have found Axis Bank to be a strong and vibrant organisation with some great strengths, particularly in retail liabilities and corporate banking. The Bank also has a culture which fosters and encourages dignity and respect for all individuals and is very welcoming of outsiders. The key priorities for me have been to build and diversify the Bank’s product portfolio, enhance the capabilities in risk management and HR and overall build an institutional, scalable platform commensurate with the scale that the Bank has gained in the recent years. Q. Looking ahead, which business lines do you see aggressive growth in the banking sector in? We are really excited about the India story, notwithstanding all the headwinds and challenges we are reading about these days. We remain positive on the structural growth story of India in the medium-to-long term, and hence all aspects of banking will continue to see growth. Given the evolution of banking, clearly mortgages, auto finance and consumer loans, which are underpenetrated will see rapid growth. We also believe that mobile banking will enable India to leapfrog the typical evolution of payments infrastructure from cash to cheques to cards. This arena is conducive to some innovative, path-breaking banking models going forward. On the other hand, corporate India will continue to seek opportunities for growth both in India and overseas, be it in infrastructure or other sectors. Q. Increasing urbanization and rising spending power continue to drive intense competition in the retail banking space. How do you see Axis Bank successfully competing and differentiating itself in this arena? The Bank has a sweet spot in the mass/mass affluent segment and is known for high levels of customer engagement and loyalty in its branches. We believe that this is a sustainable differentiator for us going forward. Of course, we will have to ensure that we have competitive products, innovative delivery models, responsive turnaround times, etc. Q. How do you view the role of technology and innovation in banking? Are there any specific investments that Axis Bank is making in this direction? Technology has typically been in the background as far as banking is concerned, but that is fast-changing. Today’s consumer is embracing technology very quickly, with significant repercussions on customer segmentation, product design and delivery and indeed the analytical backbone on which banks can design their offerings. We believe that a lot of innovation will happen around these areas. We are investing in building our analytical capabilities and of course in continuing to scale up our technology architecture so as to make it more robust and flexible at the same time. Q. Could you share a bit about the opportunity and challenges you see in Rural Banking? The rural opportunity needs a nuanced understanding – today agriculture accounts for less than half of the rural GDP. The rural ecosystem is therefore a lot about services and small industries in addition to the agricultural ecosystem. The current opportunity is centred around consumption and micro-credit, which has not been the domain of traditional banking models. We are in the process of designing and running some pilots to test the waters in this space and will be guided by the results of these pilots before we take the next steps. Q. In the past couple of years, there have been a number of new banks and NBFC’s. Could you share your thoughts on the room for more banks in India and their challenges? At the end of the day, banking is a business of trust and unless new entrants already enjoy the confidence of customers in their existing businesses, they will need to build the trust over several years. This is likely to be their greatest challenge. Having said that, some of the players who may be present in other lines of business (e.g. NBFCs), could certainly bring their own business models to the banking space, and to that extent, they will challenge existing players, and the customer will benefit from this. Q. Finally, what is your vision for where you want to take Axis Bank in the years to come? A couple of years ago, the entire senior management team developed a vision for the Bank which essentially says that over the next 3-5 years, we would like to deliver consistent, profitable growth at a premium to the industry, with a diversified business model. We would like to ensure maximum share of wallet of our customers, but want this to be driven by customer insight and consistently superior customer service.